Imagine that you spent thousands of dollars just a few years ago to build yourself a brand new deck. It’s a beautiful Piedmont Triad deck; there is absolutely nothing wrong with it, but you have changed your mind and decided that you made a mistake. You really should have purchased a screened porch. Uh oh. Wait! This doesn’t have to be a story with an unhappy ending. You might think that you either have to live with the unsatisfying deck or tear the whole thing out and start from scratch. Those are certainly both options, but we recently completed a project that is proof that there is a third, better opportunity that will get you the Greensboro porch you want without sacrificing the deck investment you have already made. 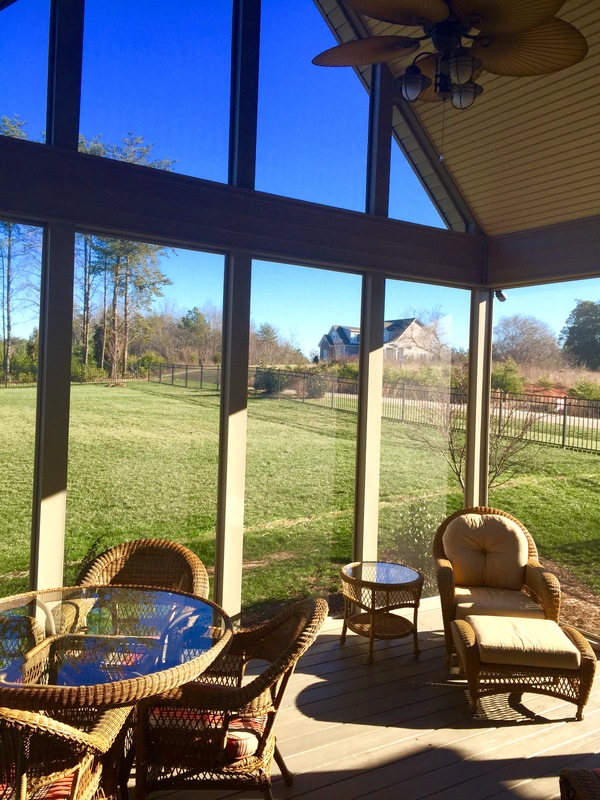 Take a look at the gorgeous windows on this new screened porch: they look like they belong in a European cathedral. 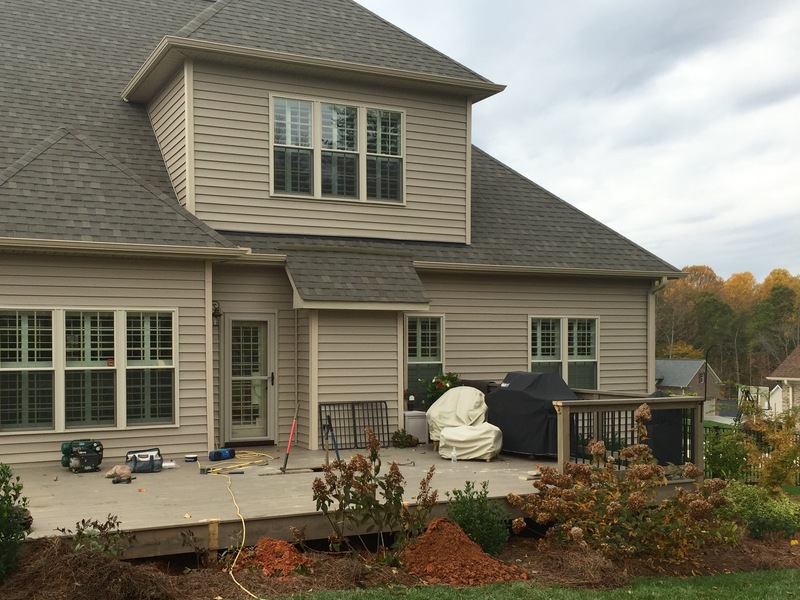 This particular home has a complicated roof situation and the best fit that we could design in keeping with the existing style and structure was a hip roof with a steep pitch. The payoff is this dramatic view of yard and sky. The new exterior lines of the home are no less impressive and the profile catches the eye of everyone who drives by this corner lot. Although the high ceilings and the windows really steal the show, the best part of this porch may be found below your feet. We were able to build the porch using the existing floor of the deck. Part of the deck is now inside and part of it is outside. None of it went to waste. The screen door from the porch leads out to the remaining part of the original deck. The high ceilings give the porch a roomier feeling than its footprint might suggest. The ceiling fan and beige beaded vinyl ceiling keep it from looking excessively high. The beige will also do a better job of hiding dirt and cobwebs than the white that many people choose. This combination of shaded and open spaces will serve this family beautifully for many years to come with absolutely no regrets. 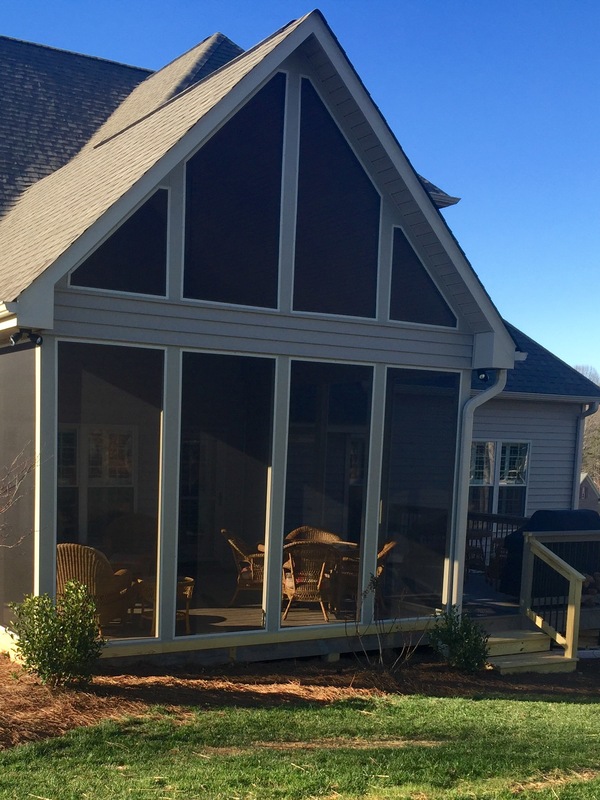 If you are interested in learning more about our screened porches, three and four season rooms including our Eze-Breeze enclosures, please contact Archadeck of the Piedmont Triad today. Call us for a free consultation (336) 664 -1332 or email us at [email protected] Also please visit us at piedmont-triad.archadeck.com.